Here you can see where Vinnie re-worked the back end of the car. 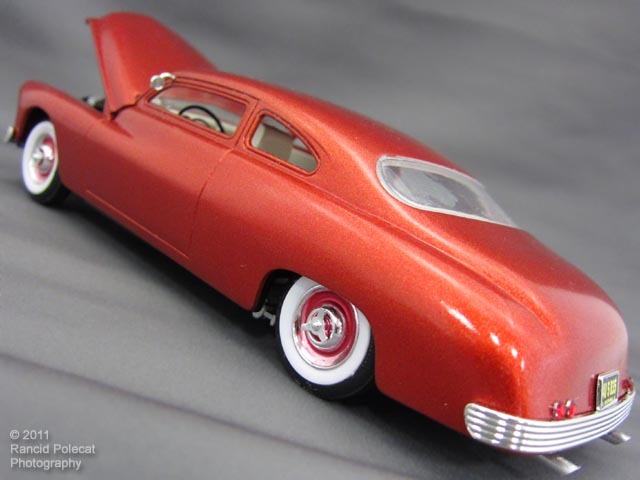 He re-countoured the deck lid and angled the rear edge of the fenders which really imparts a sense of motion. The taillights are craft store gems. Exhausts are angle-cut aluminum tubes. Design by Black Seal Design Group. All content copyright © 2003-2019, Maryland Automotive Modelers' Association (unless noted otherwise). All Rights Reserved. No part of this document may be reproduced in any form without the express written consent of the copyright owner(s). Now, hush up and eat your vegetables!